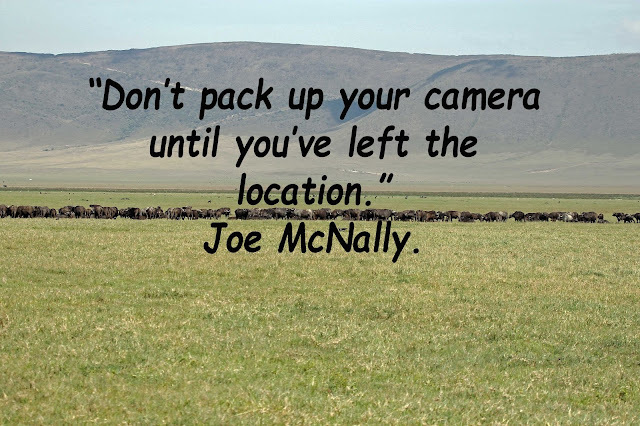 This weeks photography quote comes from Joe McNally. Joe McNally (born 27 July 1952) is an American photographer who has been shooting for the National Geographic Society since 1987. He was born in Montclair, New Jersey and received his bachelor's and graduate degrees from the S. I. Newhouse School of Public Communications at Syracuse University. He is based out of New York City and resides in Ridgefield, Connecticut. From 1994 until 1998 Joe was LIFE magazine's staff photographer, the first one in 23 years. His most well known series is the "Faces of Ground Zero — Portraits of the Heroes of September 11th", a collection of 246 giant Polaroid portraits shot in a three-week period shortly after 9/11. A large group of these life-size (9' x 4') photos were exhibited in seven cities in 2002, seen by almost a million people. If you are thinking about upgrading you camera, buying that new lens you always wanted or getting more accessories, now is the time to buy, while the Black Friday sales are still on. The easiest way to do it is online so you don't get stuck in miles of traffic queues or hoards of shoppers! B & H Photo have some cracking offer available as you can see below. They also run a deal of the day, so it is worth subscribing to their email list to get regular notifications of special offers. If you have all the kit you need at the moment, why not brush up your skills by taking advantage of one (or all) of Photography Concentrate's tutorials. All of their courses are available at a massive 50% discount and not only that, their main Black Friday sales page has a giveaway for a $500 Gift Card to Amazon.com (giveaway entry app at the bottom of the page). The giveaway will run the length of the Black Friday sale (Nov. 20 to Dec. 4) and there is no purchase necessary to enter, and there are plenty of ways contestants can earn additional entries through social sharing. Our friends Rob and Lauren at Photography Concentrate, are holding another great Black Friday sale during which all photography tutorials will be 50% off, which on its own is great news, but in addition they will be slowly releasing a new photography course for free. It's called How To Photograph Life: 14 Days to Better Photos of your Family, Travels, + Everyday Adventures. This is a free limited time course that they will be releasing from November 20 to December 4th on their website. Taking amazing photos of your family, travels, and everyday adventures is actually pretty challenging! Anyone who has tried to shoot a toddler who lives in perpetual motion, or document a new city filled with overwhelming details, will know exactly what I mean. Here is what the course will be covering each day. CAMERA SKILLS Learn technical tips and tricks that will help you see a fast improvement in the quality of your photos. LIGHT Learn how to tackle event the toughest of lighting situations with ease, and create photos that shine. COMPOSITION Discover the nitty gritty compositional tools you need to take your photos from good to glorious. STORY TELLING Discover how to make the leap from documenting jumbled moments to creating a compelling photographic story. MOTIVATION Learn how to stay motivated, and keep clicking, even when your brain and your body are fighting against you. GEAR Find out what gear you should be using to document your life, plus get a sneak peek inside our own camera bags! VIDEO Get a crash course in how to use your camera to create videos and start documenting your life in an exciting new way! WORKFLOW Discover our simple tips for getting your photos onto your computer (and being able to find them years later, easily!). EDITING Discover how to bring out the best in your digital photos with our crash-course on photo editing. BACKUP Learn how to keep your precious photos safe with our essential (and easy) backup tips! SHARING Learn how to make the sharing process enjoyable, plus get tips on how to get beautifully printed photos into your hands! CREATIVITY Discover fun and inspiring strategies that'll keep your creative juices flowing forever! Simply go to their site and subscribe to their free newsletter and get the links to each sent straight to your inbox. Not only that, their main Black Friday sales page will have a giveaway for a $500 Gift Card to Amazon.com (giveaway entry app at the bottom of the page). Each lesson from the course will also have a giveaway (as an incentive to share the course). These will be smaller giveaways of $50 Amazon Gift Cards. The giveaway entry app is located at the bottom of each lesson page. So that's one main prize of $500, and 14 smaller prizes of $50 each. Lot's of chances to win. Today's featured photographer is David Birchall. My love of photography began many years ago when I was about to become a father for the first time, and realised I would need a camera to take some pictures of the new arrival! A keen amateur photographer friend sold me his spare Zenith E 35mm camera, and I found after a lot of trial and error and self-teaching that I could produce half-decent results. After recording my children Lucie and Mark growing up at every birthday, holiday, and Christmas, I started to find rest, relaxation, and tremendous satisfaction disappearing into the hills to record the landscape and changing seasons. Since those far off days I have gone through a succession of 35mm and medium format film cameras, and like most photographers I am now well and truly in the digital age. When I first became interested in photography I was working in the I.T business, or computing as it was called back then, and spent many years juggling a working career with a budding photography business. Family commitments and the need to pay the mortgage meant for a long time that photography had to take a back seat, which was very frustrating because on numerous occasions I had to turn down photographic work because it clashed with my day job. Two redundancies in quick succession a few years ago made me decide to give up the I.T business and concentrate full-time on photography. The children had grown up and left home, the mortgage was paid off, so I thought – why not ? I had got to the point where I was disillusioned with the corporate world, sitting in meetings most of the day wearing a suit and tie, filling in forms and writing reports, and listening to people trying to impress with the latest buzz-words was not what I wanted to do for the rest of my working life. I would generally spend a couple of days each week in London but find myself gazing out the office window looking at the cranes on the London skyline thinking what an excellent picture it would make, or thinking I’ll be out of here in a couple of hours and I can get out and about with my camera…it was definitely time to move on. I worked as a wedding photographer for a while, which was very enjoyable but very hard work. People tend to think of it as being well paid to press a shutter for a couple of hours on a Saturday afternoon but there is far more to it than that. If it was that easy I would still be doing it! One of my more memorable experiences of wedding photography was photographing the weddings of three sisters in turn over three consecutive years, and then photographing the wedding of their mother when she re-married the following year, they were my best customers! From Manchester originally but now living in Chesterfield on the edge of the Peak District, I feel privileged to live in one of the most spectacular areas of outstanding natural beauty in England. The photographic opportunities are endless, whatever the weather or time of year. My wife Bev and I are keen walkers and getting up into the hills is something we love to do whenever we can, with the camera of course. We also like to travel as often as we can, which also gives me the opportunity to boost my stock at one of the specialist travel photographic libraries I submit work to. People seem to like my pictures, I think it’s because I go for bright punchy colors, images which catch the eye and would look good hung on a wall. 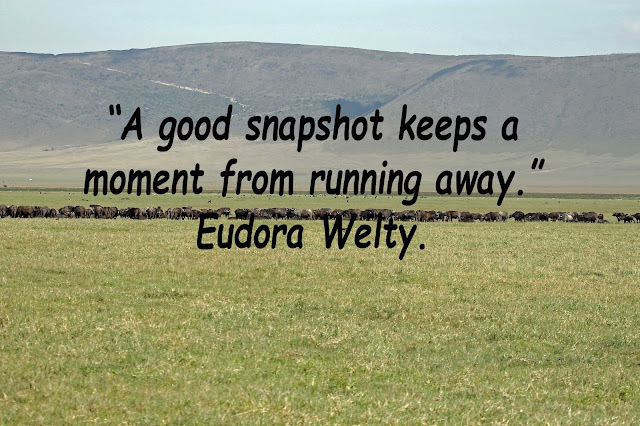 My photography principles are simple. If somebody likes one of my images sufficiently to buy a print from my website, or to use in a publication, I am more than satisfied. I like to think my images bring pleasure to the viewer, and if it inspires them to visit that place, or pick up their own camera, I think I have done a good job. Today we come onto the letter Q, and I must admit that I am going to have to cheat a little! I have no images beginning with Q so I have used a couple of images of Victoria Falls, which were of course named after Queen Victoria, and an even more obtuse connection is a photo of the birthplace of Freddie Mercury, who was the lead singer of Queen! View from the Zimbabwe side of Victoria Falls looking towards Cataract Island. The spray from the falls can be seen from the town. A rainbow formed by the spray at Victoria Falls, Zimbabwe, Africa. Mercury House, Stone Town Zanzibar, alleged to be the birthplace of Queen singer, Freddie Mercury. Following a visit to Budapest last summer, I have put together a short You Tube presentation of a few of my favourite tourist sites. These include the Grand Central Market, three of the city's famous bridges, Chain Bridge, Margaret Bridge and Liberty Bridge. There is also an image of the Emanuel Tree, a weeping willow tree (by Imre Varga) with the names of Hungarian Jews killed during the Holocaust inscribed on each leaf. You also see the colourful Matthias Church, the Fisherman's Bastion, a couple of shots of Budapest trams, and of course, the iconic Parliament Building. Simply click on this link to view my Hungary Gallery.